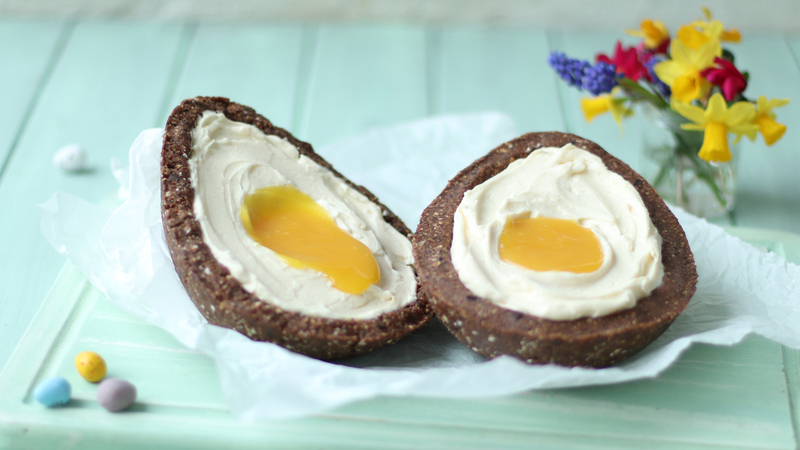 The kids are going to love making and of course eating this Giant cream egg. It would make a great centre-piece on an Easter party table. Medjool dates have a wonderful toffee squidginess, so be sure to seek out these rather than regular dates if you can. If you can’t get hold of an easter egg mould then use any plastic mould you may have received your easter eggs in. The mould used here was from the Galaxy Golden Eggs Easter egg (measuring about 7 inches in length). Alternatively, you may have bowls of a similar shape or you could try shaping by hand. It may look a little messy in this case but you could always serve it as if it had been ‘smashed’! 1. Place the dates in a small bowl and pour over enough hot water to just cover. Leave for 15 minutes to soak and soften. 2. Drain the dates well and blend in a food processor to give a fairly smooth paste. Add the chocolate, oats and peanut butter. Blitz everything together until you have a chunky paste. 3. Divide the mixture evenly between two halves of an Easter egg mould, spreading it out and levelling the surface and edges with the back of a spoon. Cover with cling film and chill in the fridge for about 2 hours (or freezer for half the time) until set. 4. Meanwhile, make the filling. Snap the white chocolate into a small heatproof bowl, add 50ml of cream and melt in the microwave in 30-second blasts, stirring between each go, or over a pan of simmering water, shallow enough that the water doesn’t touch the bowl. When melted, stir until smooth and leave to cool to body temperature. 5. Beat the mascarpone in a large bowl for a minute to loosen. Sift in the icing sugar and beat in along with the vanilla seeds. Whisk the remaining 175ml of cream in another bowl until just stiff. Beat the cooled chocolate into the mascarpone, then fold in the whipped cream. 6. Carefully remove each half of the egg ‘shells’ from the moulds and arrange on a serving board, plate or cake stand. Divide the filling mixture evenly between each one, spreading it flat. Make a little dip in the filling towards the bottom of each one and spoon the lemon curd into it. This can be assembled up to one day ahead. Keep covered in the fridge until ready to serve.